I’m not 100% certain whether it was me or my brother Ken who bought this issue of SUPER-FRIENDS, but I ultimately ended up with it. And I really liked it–so much so that i ripped off its central villain for one of the amateur comics that I was creating at around this time. It’s a very fun story by author E. Nelson Bridwell that makes full use of the DC Universe,. The story was wonderfully illustrated by Ramona Fradon. Fradon is one of the more overlooked geniuses in the history of comics, partly because much of the work she did over the years was uncredited, and partly because her style was more overtly cartoony than most of her contemporaries–a quality that made her a perfect fit for the cartoon-based SUPER-FRIENDS. Her characters all had bounce and life to them. The story opens with Aquaman and Wonder Woman in mid-battle with Spectrum, an intergalactic slaver with a super-powered aura. Aquaman makes use of the fact that Spectrum comes from a desert world and is unaware of the properties of water to distract him so that Wonder Woman can ensnare the villain with her magic lasso. But he instantly disappears from its grasp. 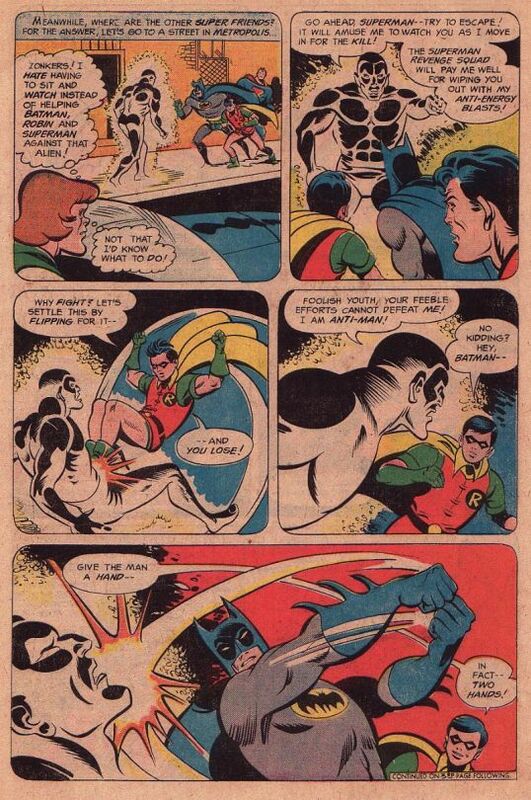 Simultaneously, Superman, Batman and Robin are tackling Ant-Man, who has been sent by the Superman Revenge Squad. 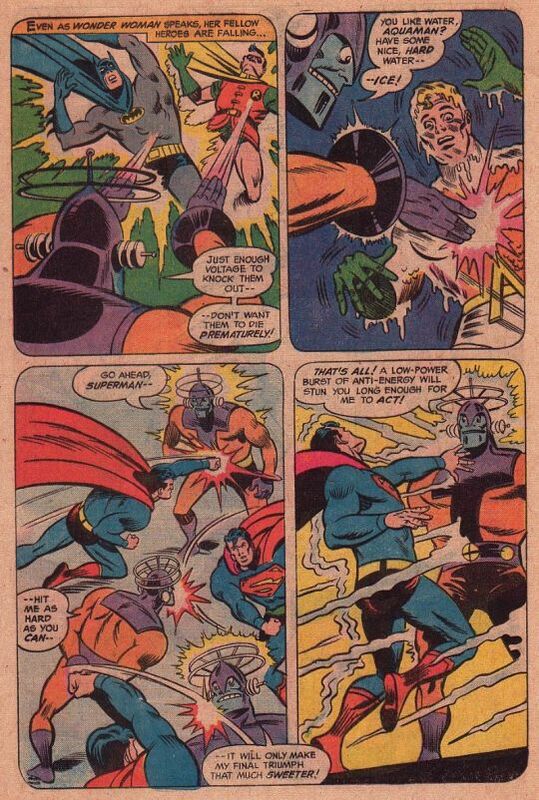 But Anti-Man is vulnerable to X-Rays, so Superman peers him into submission–at which point he too vanishes before the confused super heroes. The two villains find themselves reconstituted in prison cells–but they’re not in custody. Rather, they’ve been captured by the evil Dr Indrom, a master villain who is tired of being foiled by the many super heroes of the universe. Indrom has taken it upon himself to round up dozens of dangerous super-criminals so that he can dis-corporate them all and infuse those powers into a mighty composite being; the World-Beater. Indrom intends to dispatch the World-Beater to wipe out all of the super heroes in the universe with his aggregated super-powers. It must be said that the World-beater’s design, with its strange head-rings and antennae, is simultaneously ludicrous and pretty great. 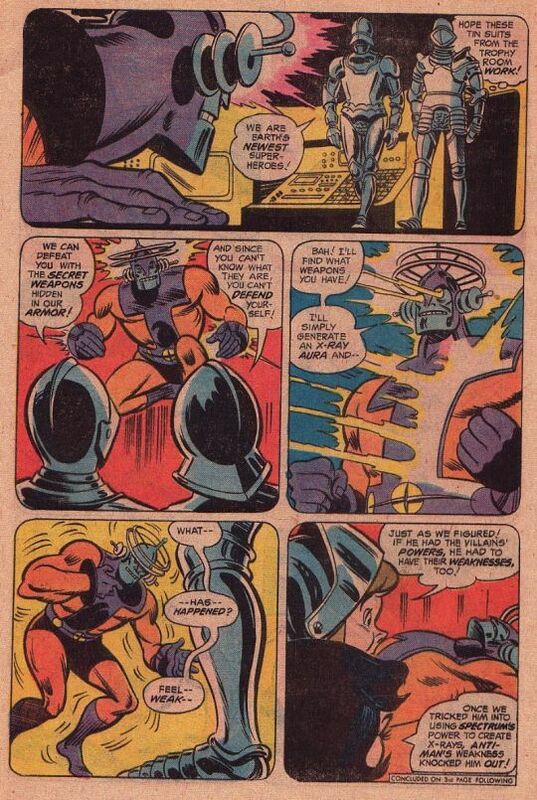 And he gets right down to business as Indrom sends him to the most super hero-populated planet of all: Earth. 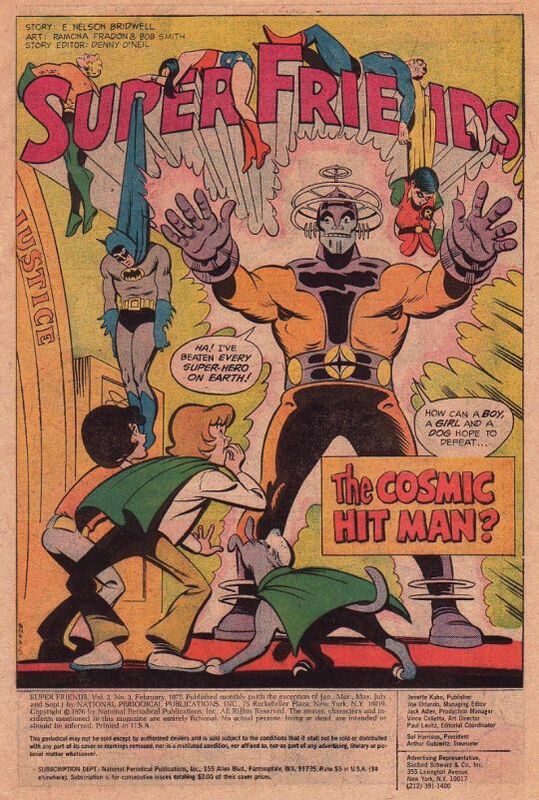 In short order, he invades the Justice League satellite, telling the assembled heroes that he’s already taken out the Blackhawks, the Teen Titans, the Freedom Fighters and Plastic Man. And then he proceeds to dismantle the League one by one in short order. 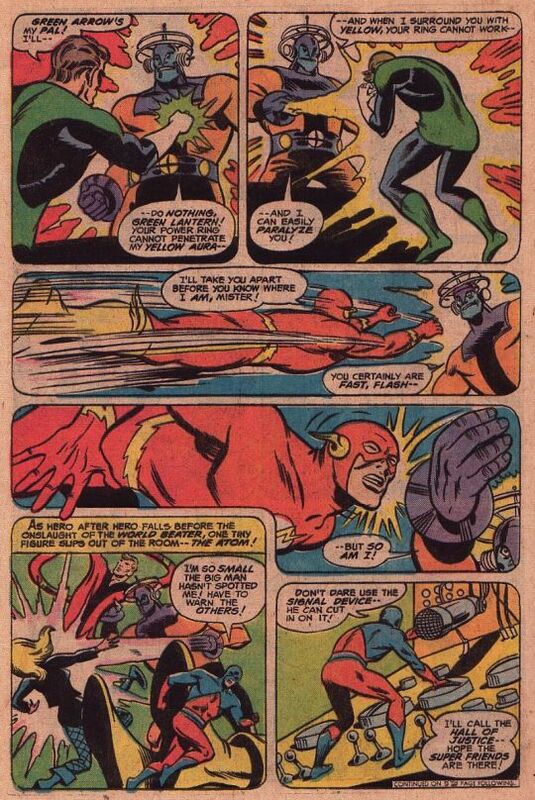 The Atom gets off an emergency call to the Hall of Justice, alerting the Super-Friends to the peril. But then, the World-Beater is there, among them, having teleported in. Superman tells WB that his creator Dr Ingrom has already been arrested by the authorities and that the Super-Friends are aware that he’s a composite being made up of the molecules of dozens of super heroes. But none of this seems to matter, as the World-Beater mops the floor with the Super-Fiends. From the shadows, Wendy, Marvin and Wonder Dog watch–Wonder Woman has previously told them that her mother Hippolyta’s Magic Sphere has prophesied that they will hold the key to victory today. But how can they stop a foe who’s trashed the entire Justice League? Brains, of course! First, Wonder Dog distracts the World-Beater long enough for Wendy and Marvin to don armored suits and present themselves as Earth’s newest super heroes (very much in the style of Sir Prize and Miss Terious, two characters Bridwell had introduced in a Legion of Super Heroes story a decade before, and which I had read in a reprint.) They goad World-Beater into using Spectrum’s powers to create X-Rays so that he can determine who they are and what powers they possess–and the big lug falls over crippled as a result. 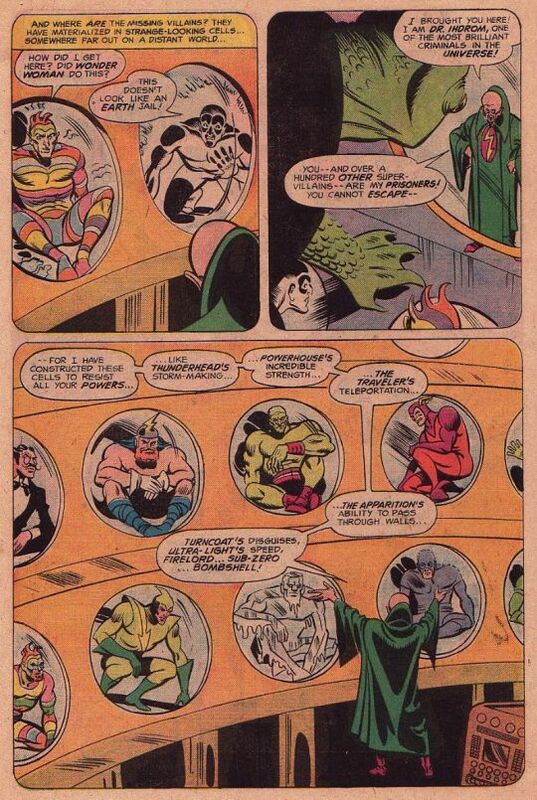 The kids have doped out that World-Beater didn’t just get the strengths of the villains who went into his composition, but also their weaknesses, like Anti-Man’s vulnerability to X-Rays. It’s an appropriately set-up and executed finale that makes the three kids look like active contributors to the team, something that wasn’t always the case on the show.